July 24th is Camp Able day! Home > Uncategorized > July 24th is Camp Able day! Coronado proclaims July 24th Camp Able Day to support recreation for those with special needs Camp Able will be hosting a Community Day event on Friday, July 24th, from 10-2. This is an opportunity to come out and experience a typical day at Camp Able and learn more about the program. Mayor Tanaka will be in attendance and will be giving a proclamation. A free BBQ lunch will be served to all who attend, and there will be a bounce house for children. Whether you are a past supporter of Camp Able or are unfamiliar with it, please stop by and check out this unique program that has been providing services to people with disabilities for 35 years! 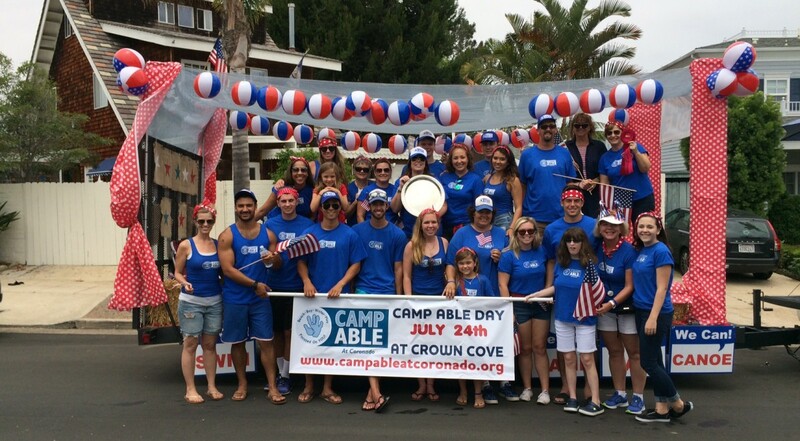 Camp Able would like to extend a special invitation to our generous local donors and members of the local organizations that have supported our program in the past year, including the Rotary Club of Coronado and the Soroptomist International of Coronado. This program could not continue its service without the generosity of many Coronado individuals, organizations, and businesses. Camp Able is located at the Silver Strand Aquatic Center, on the bay side of the Silver Strand State beach. For access, park in state beach parking lot #3 and walk through the tunnel towards the bay. Please RSVP and direct any questions to: campable@yahoo.com . Camp Able is a non-profit organization that focuses on empowering the disabled community through an increased appreciation and awareness of ABILITIES in an incredibly FUN and SAFE aquatic environment. Through grants and charitable capital, Camp Able provides services that help contribute to the vitality of our campers while fostering compassion and respect for all. Copyright � Camp Able 2018. All Rights reserved. We are a non-profit 501(c)(3) our Federal Tax ID is 330868418. Camp Able is an auxiliary of SDSU. Copyright © 2019. All Rights reserved.